It has been claimed that Dropbox was hacked earlier today. When the site was unreachable, people got cranky and then, some hackers claimed that they had hacked Dropbox, complete with a database of details. 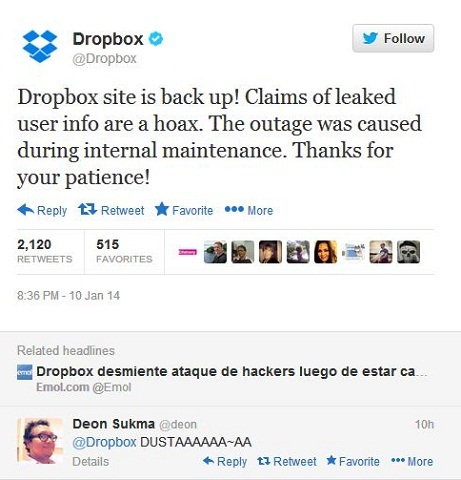 But Dropbox has hit back with the information that this was a hoax. They claim that the database posted is not from Dropbox, but actually an old one posted last month. Out of the two, Dropbox’s claim seems legit. But one can’t be sure, so do change your passwords and take care of all your financial data. In case, you have personal data, we would advise you to encrypt it. “Dropbox site is back up.